Seaplane Global Air Services of the USA has placed a ‘firm’ order with Beriev Aircraft Company (part of UAC, United Aircraft Corporation), for four Be-200ES twin-engined amphibian aircraft, plus options for six more, the Russian manufacturer reveals. The Be-200ES is a renowned water-scooping, firefighting aircraft that has a wingspan of 108 feet, a flight range of 2,051 miles, a top speed of 435 miles per hour and weighs more than 60,000 pounds. The sales document, signed at the recent Hydroaviasalon amphibian air show in Gelendzhik (Russia), reveals that the first two aircraft will be powered by their original Ukrainian D-436TP turbofans, whereas the remaining two will come with a new engine option: the Russo-French SaM-146s, which also power the Sukhoi Superjet 100 (SSJ100) regional airliner. No delivery schedule or transaction value details have yet been disclosed. The Be-200 offers twice the water capacity and an additional two tons of retardant compared to Bombardier CL-415 turboprop. It also can scoop water from lakes, large rivers or seas. It can fly twice as fast as the CL-415 and is equipped with fly-by-wire. 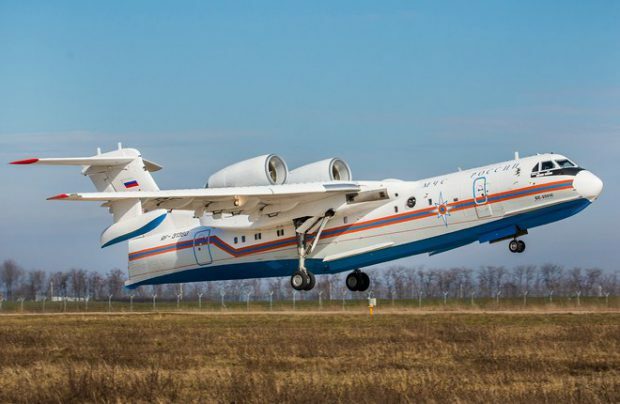 Yuriy Grudinin, general director of Beriev Aircraft Company, has expressed the hope that this latest order will “give momentum to the promotion of the Be-200 to American and European markets”. He also emphasised that the amphibian was designed purposely for firefighting and is capable of scooping up to 12 tonnes of water in 20 seconds. “In the past years, the Be-200 amphibian has built an excellent reputation both within the Russian Emercom and elsewhere in Europe. According to some reports, Seaplane Global Air Services, a little-known young firefighting company, has plans to wet- and dry-lease the water-bombers in partnership with California-based International Emergency Services, offering services in several countries, including the USA, Europe and Australia. Serially produced in Taganrog, Russia, the Be-200 received its type certificate (TC) from the CIS Interstate Aviation Committee in 2003, followed by a 2007 supplement approving the aircraft for transporting up to 43 passengers. Three years later, the Be-200 received certification from the European Aviation Safety Agency (EASA).